"My kids gobble this filling up, and it has the benefit of being easy to make and nutritious, too! Serve with taco shells and top with lettuce and cheese. My favorite use is on a taco salad with cheese, tortilla strips, salsa, ranch dressing, romaine lettuce, and peppers. Yummy!" Heat a large skillet over medium heat. Cook and stir beef in the hot skillet until browned and crumbly, 5 to 7 minutes. 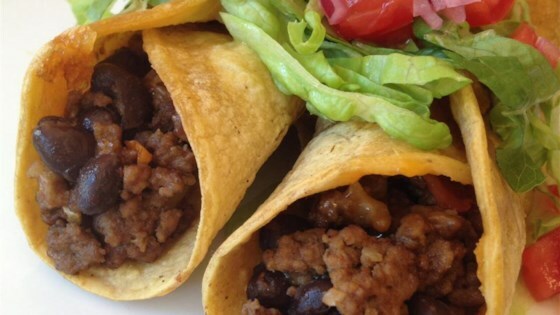 Stir black beans with the ground beef; add salsa, water, and taco seasoning mix. Cook, stirring frequently, until the mixture is heated through, 5 to 7 minutes. I used ground chicken browned in olive oil & doubled the recipe. Made great taco salads! This will be my new go-to recipe for quick taco salads. Thanks for sharing your recipe!! Very fast and easy, plus super tasty! Would consider adding corn with a large amount of meat for that extra kicker. Was such a great recipe and so easy to make. Something new to try with ground beef. Served it over rice instead of in a taco shell. Worked out great.